Construct your own creative coaster with this laser-cut wood kit. 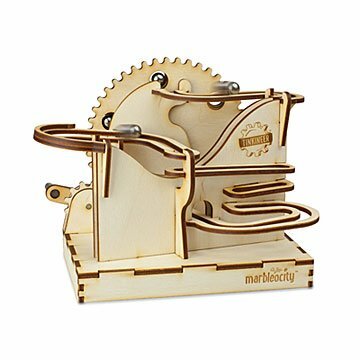 Take your imagination on a DIY ride full of dips, turns, and daredevil demonstrations of physics and engineering with this laser-cut wood roller coaster kit. With no special tools (just household white glue), more than 30 Baltic birch pieces come together to make a mini marble coaster. Powered by a hand crank, the DIY thrill ride runs on kid power instead of batteries, and includes engaging instructions in graphic novel form to make building it half the fun. This playful kinetic sculpture makes a great gift for tinkerers young and old. Ages 9+. Designed by Adam Hocherman; made in Beverly, Massachusetts. Cute little project for either an adult or older child. Instructions were not easy to follow. Suggestion would be to number the parts to go with instructions. Product is easy to read. Must follow directions to get it to work. We had to fix on our feet a slight balance problem so the marble would roll. This was purchased for a child who loves building and tinkering; he enjoys taking things apart, but doesn't necessarily know how to put said things back together so they work again. The designers of this STEM toy took the creativity of basic marble runs and added mechanics and basic machines to the equation, instantly capturing my kid's fascination. He was able to put the entire coaster together with no help other than the instructions provided. I'd purchase another set without hesitation. Note: The glue is provided and was important to use for stability. Wood pieces were warped, marbles did not fit through the pre-made holes. Once built, had to tilt so far to get marbles to move, they fell off track. Bought for 11 yr old, adults had to assist with gluing and holding together. Wish I would've researched better on this. Had a very disappointed kid. The 12 y/o learned to follow non-electronic (thank you!) directions had quality time with Grandpa, both of whom enjoyed themselves during the building process. Then the 5.5 y/o got to play with it and was beside himself with excitement. An excellent gift all around. I think it will be in use for quite awhile. It was super easy to assemble and came with great instructions! Excellent birthday gift for an 11th birthday. Excellent quality of parts and assembly instructions.